This ultimate twin tower offers the perfect mix of active play and imaginative space. If you have room, a split level double tower wooden climbing frame with tube slide is an outstanding choice. 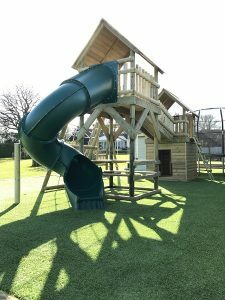 Constructed from the highest quality pressure treated round timbers, this play centre will last for years and years to come. It also offers sufficient versatility to keep the children entertained throughout the span of their childhood, from toddler to teenagers. The first tower comprises of a 2.1m high platform, accessed by a wibbly-wobbly cargo net. At full height to the balustrade this one is a real challenge. But when reaching the top, the reward of a zippy tube slide is the best way to travel back down in style. The view from the top is amazing and worth revisiting again, and again, and again. Descending the incline bridge takes you to the second play tower. At 1.5m high, it is perfect for a clad base play den with open door for hide and seek. 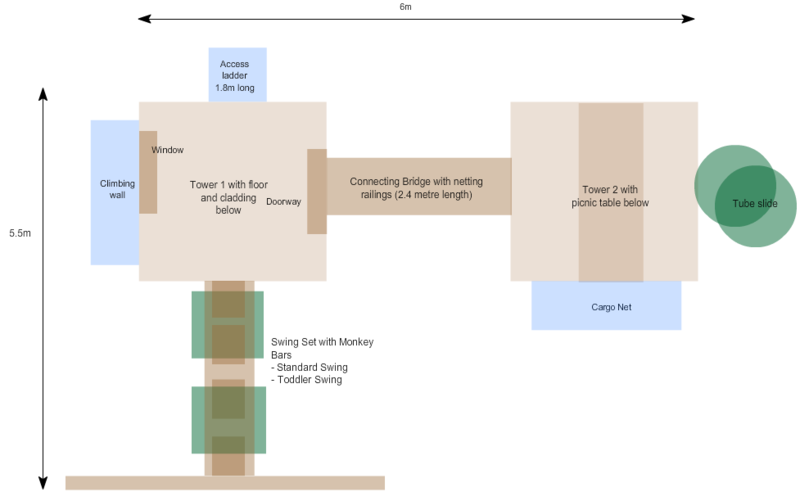 There’s a climbing wall around the back of the tower and a sturdy swing set with monkey bars to take intrepid explorers across to the platform. If climbing and scrambling is their passion, then it’s all in hand. This beauty has a challenging vertical climbing experience on the side of the two towers as well as the monkey bars and tall cargo net. All these frames are pressure treated in good quality timber and, despite being guaranteed for a ‘mere’ 10 years, will invariably last much longer. All our timber is sourced from sustainable suppliers, is pre-treated softwood primed for outdoor use and guaranteed for 10 years. This climbing frame is constructed with Rounds timber.